I can (sadly) recall several occasions over the last few years when someone I know has called to say that they have just been diagnosed with a serious illness and they wonder if I know of any clinical trials for which they might be suitable. Often I spend hours trawling clinical trial registries and the websites of academic institutes or pharmaceutical companies to find a few suggestions, and (if I'm lucky) contact details for an investigative site. What amazes me is that in this time of unfettered access to all kinds of data, it is still difficult for patients to find readily accessible information about clinical trials. We do have registries, but with protocol-derived descriptions that make up their web pages. Patient advocacy groups sometimes have better trial descriptions, but often only feature a select few trials. Why is the information that is provided so hard to find and so difficult to understand? Why do our clients sometimes freeze when we talk about advertising a study or providing study information to potential participants in language that doesn't replicate the medico-legalese of the Informed Consent Form (ICF)? I believe this is because raising awareness about clinical trials is one of the few healthcare communication arenas that necessitates reaching out to patients (albeit indirectly) about an investigational or approved prescription medication — and companies fear this outreach may be perceived as 'coercive'. The upshot is that the vast majority of patient-facing material is factual, to the point of being boring, but why can't it also be interesting and informative? Regulatory guidelines exist to protect the patient from unethical practices, not to protect them from information. Is it not, in fact, a patient's right to be given information about medical research that may (or may not) benefit them or society in general? No longer can we pretend that we are protecting the patient by being terrified to provide them with accessible information about clinical trials. There may be an argument that by doing so, we are pushing patients towards unethical, unregulated treatment information and options. When I moved from working in medical education to patient recruitment and retention, it was a decision based primarily on the fact that of all the healthcare communications disciplines, this is the only one that regularly works with ethical medicines and produces patient-facing communications. It appeals to all those tree-hugging, power-to-the-patient, hand-me-my-soap-box type beliefs that propelled me out of the research lab with a view to raising public awareness of medical issues in the first place. Nearly a decade on, despite losing the Doc Martens and green parka, I still have those beliefs and they are the reason I stifle a chuckle when my GP friends complain about how the internet has led to 'questioning' — rather than 'accepting' — patients. But just what type of information does this 'new' patient have and where is he getting it? As anyone in clinical trial communications knows, one of our greatest challenges is to overcome the perception that clinical trials involve groups of Einstein-esque, mad-cap scientists running around, randomly injecting patients with drugs they whipped up in a test tube. For example, at the end of last year, a writer on a well-known US breast cancer blog questioned the ethical nature of a television advertisement for a particular trial by sharing the view that it was a marketing ploy to promote a non-FDA approved medication — despite the fact that the ad had received the necessary regulatory approvals. Unfortunately, this opinion and others like it are found throughout social media. Too often, the 'informed' patient that my GP friends dread is, in fact, a misinformed and anxious patient who does not have the kind of information needed to make a truly informed choice. In the absence of an industry-driven response to the current state of patient understanding of clinical research, this situation is unlikely to change. Before we point fingers at the 'gullible' public, perhaps we ought to look closer to home. Most of us in this industry will be able to relate to the dinner party dismay that results when someone asks us what we do for a living. No matter how many times I have been asked this question, I still briefly consider whether it would be possible to drown myself in my glass of pinot noir before I launch into an explanation about: "Helping pharmaceutical companies communicate effectively about clinical trial participation, so patients aren't treated as 'guinea pigs' and so on and so on..."
Why do we feel this need to justify what we do when most people, if asked: "Do you think that we should be working towards continuously improved healthcare options for patients?" would answer "Yes." What is the best way effectively to raise awareness and provide meaningful information about a particular study or clinical trial participation in general? Many people will insist that all such information come from the treating physician. But this begs the question: are time-deficient physicians really going to be able to search for an appropriate trial for their patients? In many instances, physicians will only be able to give their patients information about studies they are already aware of, either because they are involved in the study themselves or as a result of investigator outreach in their local area. However, a patient who has made a decision to consider medical research wants to know all his or her options. Even before this stage, however, patient communication needs to be considered in terms of choice rather than undue influence. Effectively raising trial awareness should, therefore, involve reaching out to patients as well as healthcare professionals. Of course, this is not as easy as it sounds — for example, global studies require an understanding of the acceptable and appropriate practices for multiple countries. The regulations regarding outreach to patients and the interpretation of these regulations vary by country, by pharmaceutical company, and even by ethics committee (EC). So how do we ensure that the patient is getting the information he needs while working within these regulations? The US Food and Drug Administration (FDA) and the Association of the British Pharmaceutical Industry (ABPI) provide guidance on advertising for raising awareness of clinical trials, but it is specifically for print and broadcast media, not for more comprehensive documents like study leaflets (our bread and butter). At the other extreme, guidelines on patient information sheets (which accompany ICFs) do exist, yet for patients who want initial information on a study, these sheets are often highly complex and detailed. The long and the short of it is that there are no all-encompassing, hard and fast rules. So what does the typical approval process for a patient recruitment campaign look like without this clarity? Once a campaign has been developed, the first stage of approvals involves the sponsor company's medical, legal and regulatory department. Normally this is a relatively straightforward process, but it requires an in-depth understanding of the client's interpretation of the International Conference on Harmonisation Good Clinical Practice (GCP-ICH) points. This can vary not only from company to company but also within an organisation. For example, one party may feel it is important to provide information about approved treatment options, whereas another is in disagreement. Better guidance on what information can or cannot be included in recruitment materials would help resolve this issue. This is also demonstrated by the ABPI's advertising guidance, which states that the name of an investigational compound should not be used in pre-consent materials — that is, before the patient has provided their written consent to take part in the study — but this does not apply to some other countries. In theory, local regulations determine what can and cannot be done in each country. But it isn't always clear. Inconsistent understanding and interpretation of local regulations is common. I have experienced study monitors and investigators refusing all materials because "physicians cannot advertise their services". The fact that we had a similar, EC-approved campaign on-going in that very same country did little to change opinion. There is also inconsistency in how the reviews of Institutional Review Boards (IRBs) and ECs are conducted. FDA guidance states that "Communications intended to be seen or heard by healthcare professionals, such as 'dear doctor' letters and doctor-to-doctor letters..." do not need to be included in a study's IRB submission. However, one recent study site's IRB asked to review a 'dear doctor' letter — we were working to national guidelines whereas the local review board had its own rules. It is cause for concern if one body rejects a specific segment of content. This means that part of your target population will not receive certain information that might aid in its decision making, while this information is given freely to patients in another country, state or even hospital. The Royal College of Physicians' Guidelines on the practice of ECs in medical research with human participants makes the point that we all benefit from living in a society that conducts scientific research, and thus ECs have a duty to encourage and facilitate important ethical research. As clinical trial communications specialists, this is our duty as well. We need to work with our pharmaceutical clients, patient advocacy groups, IRBs and regulatory authorities to ensure that a voluntary decision not to participate in clinical research is an informed decision made after due consideration — not an uninformed response based on little or no information. We need an in-depth knowledge of regulations that are clear and consistent to ensure regional and global recruitment programmes support study teams in their efforts to provide patients with appropriate information. Furthermore, a partnership approach, which addresses a company's interpretation of regulations before the review stage, can help alleviate many concerns, reduce frustrations and limit nasty surprises. In the same way that there is no chance of going back to the days of blood-letting and leeches, there is also no going back to the days when patients relied only on their physician for information. Our information needs are being driven by the speed of evolving communication technology and it is our responsibility to ensure that patients have access to ethical, meaningful and readily available information about medical research and specific studies. Ultimately, it is our duty to give them choice and the means with which to make an informed decision. 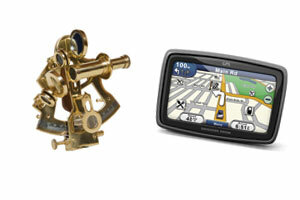 So, what would you choose: sextant or satnav? Are we going to continue to fear falling off the edge of the world, preferring to use a sextant to navigate the murky waters of clinical trial patient communication? Or are we going to give patients the satnav (with all its options) to chart their own course? Dr Emma-Kate Yates started her career in healthcare communications ten years ago after completing a PhD in Immunology at the National Institute for Medical Research. She gained experience in medical education before moving into patient recruitment and retention. Emma-Kate currently helps lead the team at Brandtectonics Access - part of Chandler Chicco Companies.